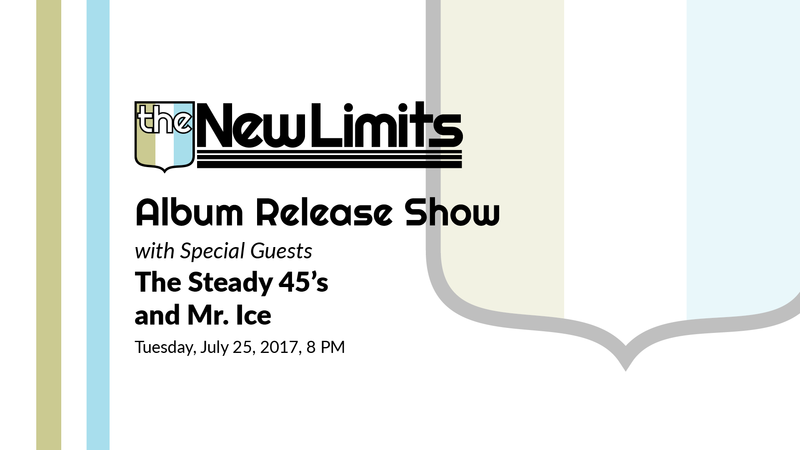 Boston-based ska, rocksteady and soul band The New Limits will release their debut self-titled album on July 25th, 2017 via Date Night Records. The new album will be available for stream and purchase on iTunes, Bandcamp, Spotify, Amazon, Tidal, and wherever else you listen to music. The New Limits follows the 2015 release of the band’s debut EP Pressure Up, which served as an introduction to the Boston band’s distinct blend of danceable music. This new record expands on that template, and presents a more diverse range of sounds than would have been possible from a four-song EP. The band will mark the occasion with an album release show on Tuesday, July 25, 2017 at O’Brien’s Pub. Having previously sold out the Allston venue, The New Limits knew this was a natural location for the celebration. Supporting the night will be roots reggae act Mr. Ice from Cambridge and rocksteady band The Steady 45s on tour from Los Angeles. Tickets are on sale now. First single and leadoff track “Loss for Words” starts with a burst of soulful energy from the rhythm section, welcoming a catchy horn line to create a groove that sets the tone for the rest of the record. In the two years since their initial EP’s release, the band began to experiment with a more soul-oriented sound, which shows in tracks like “What’s The Worst That Could Happen” and “Up in the Air”. With “Stir the Pot”, the band channels The Aggrolites for a funky, mid-tracklist jam. Showing further diversity, tracks like “New Way” and “Part of Me” have a more contemplative, reggae feel that successfully contrasts the rest of the album’s energy. 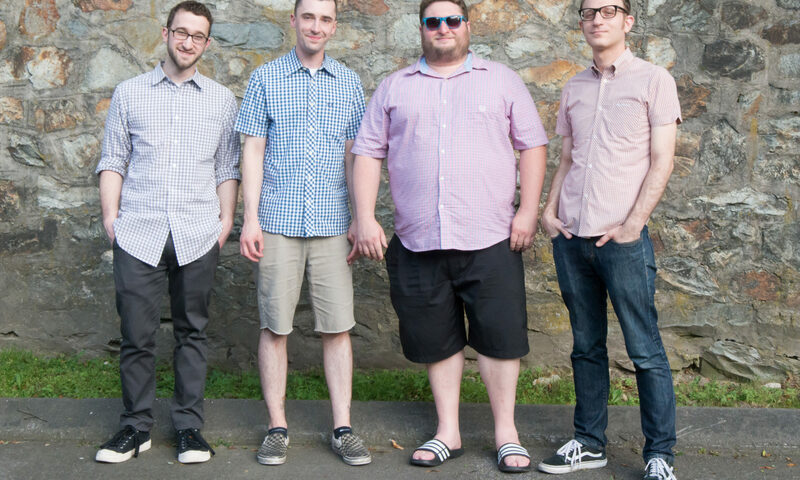 Formed near the end of 2012, The New Limits began as a collection of veteran ska musicians playing the styles of music they grew up with inside of an Allston garage. In trying to emulate the classic ska, rocksteady, and reggae sounds of the past, the band found inspiration in both local and far-reaching bands like Westbound Train, Deal’s Gone Bad, The Slackers, The Pietasters, and The Planet Smashers. The six-piece band is anchored by the rhythm section of Jake Wilkenfeld-Mongillo (formerly of New York’s The Hard Times and Hey Stranger) on guitar and background vocals, Thomas Vezeau on drums, and Alex Chiasson on bass guitar. Matty C, known for his performances with Mass. Hysteria, The Allstonians, and Big D and The Kids Table, brings his unique tenor voice to the mix, along with trumpet duties. Along with Matty, Bradford Hewitt and Miles Blackwood round out the band’s horn section on trombone and alto saxophone, respectively. The New Limits was recorded by Calum Brockie at Studio A in The Record Company, a non-profit recording studio in South Boston. The recordings were then passed to Brooklyn’s Dave Lowenthal for mixing duties, and then to Richard Marr at Galaxy Park Studios in Watertown for mastering. The band crafted the album’s 11 songs while playing at venues throughout New England, including The Middle East in Cambridge, MA, a Boston Harbor cruise supporting The Slackers, and a summer residency at Bernie’s Beach Bar in Hampton, New Hampshire. With the album’s release, the band hopes to continue to play the music they love to an even wider audience. For more information and an advanced copy of the record, please contact jake@jacobwakeup.com. 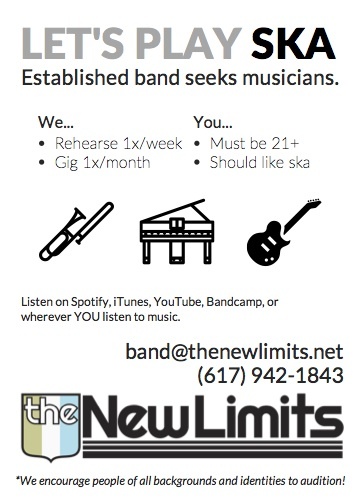 Established Boston-based ska band The New Limits is looking for a KEYBOARDand TROMBONE player! The styles we play include traditional ska, reggae, rocksteady, two-tone, and some third-wave stuff (no punk). Our influences include (but are not limited to) The Slackers, Westbound Train, The Toasters, and The Aggrolites. We practice roughly once per week and gig one to two times per month. We all have day jobs and won’t be touring any time soon, but we are committed. We’ve shared the stage with such bands as The Slackers, Westbound Train, Deal’s Gone Bad, Bim Skala Bim, The Beatdown, and The Allstonians. Please contact us if you love ska and are over the age of 21. We encourage people of all backgrounds and identities to audition!